Picture by Ash Allen/SWpix.com - 10/02/2019 - Rugby League - Betfred Championship - Featherstone Rovers v Batley Bulldogs - LD Nutrition Stadium, Featherstone, England - Cameron Smith of Featherstone Rovers during the Betfred Championship 2019. An exhibition to celebrate more than 120 years of rugby league is coming to Castleford Museum. ‘In A League Of Their Own’ will open this Saturday, as part of the West Yorkshire Local Authority Museums Partnership’s ‘We Are West Yorkshire’ initiative. 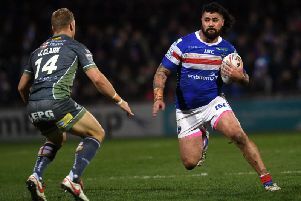 Visitors can take a closer look at the clubs within the Wakefield district, including Castleford Tigers, Featherstone Rovers and Wakefield Trinity, as well as clubs further afield in West Yorkshire. Highlights include the rugby shirt of legendary 1880s Trinity player Harper Oliver Hamshaw, the ball with which Castleford’s Arthur ‘Brus’ Atkinson broke the record for the longest penalty kick in 1929 and the 1974 Great Britain shirt of Featherstone Rovers legend Jimmy Thompson. Tom Stannard, Wakefield Council’s Corporate Director for Regeneration and Economic Growth, said: “The display is a fantastic celebration of Rugby League and shows how proud we are that it was created right here in West Yorkshire. The exhibition runs from Saturday, March 23 until March 1 2020 and admission will be free. Go to experiencewakefield.co.uk/inaleagueoftheirown for more information.